An isosceles trapezoid is a trapezoid whose sides are congruent. 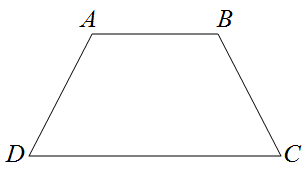 An example of an isosceles trapezoid is shown below. The trapezoid is isosceles with parallel to and congruent to . In this post, we are going to show that the diagonals of an isosceles trapezoid are congruent. In the figure below, we will show that is congruent to . It is given that is an isosceles trapezoid with . By the definition of isosceles trapezoid . Now, since the base angles of an isosceles trapezoid . Also, , since congruence of segments is reflexive. By the SAS Congruence postulate, . 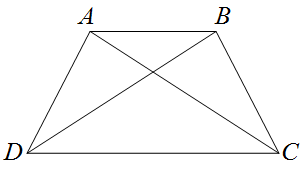 since corresponding parts of congruent triangles are congruent. Therefore, diagonals of an isosceles trapezoid are congruent.